Forest Friends & Foundation Fun! The week in school continued to be a busy one. Our WW1 week continued to take pace, with our KS2 assembly seeing Mrs Creak inform the children all about the events they can expect on Remembrance Sunday. Across the school the children continued to make their poppies whilst the older classes investigated life as a soldier in the trenches. In the Foundation Stage the children enjoyed using the Early Years Garden to make up their own ball games and obstacle courses whilst in Oaks the children investigated how particles change when solids become liquids and gases by using themselves as particles. Out of the front of the school the children from Year Three enjoyed some fun Forest Friends sessions. They spent time looking after the Magic Faraway Tree by collecting fallen leaves and placing them around the base so that a mulch can be formed. The children also worked in groups to create dens, this time with the challenge of attaching the parts without string or elastic bands. They made their own colour palettes with leaves and wrote secret messages using wax resist techniques. 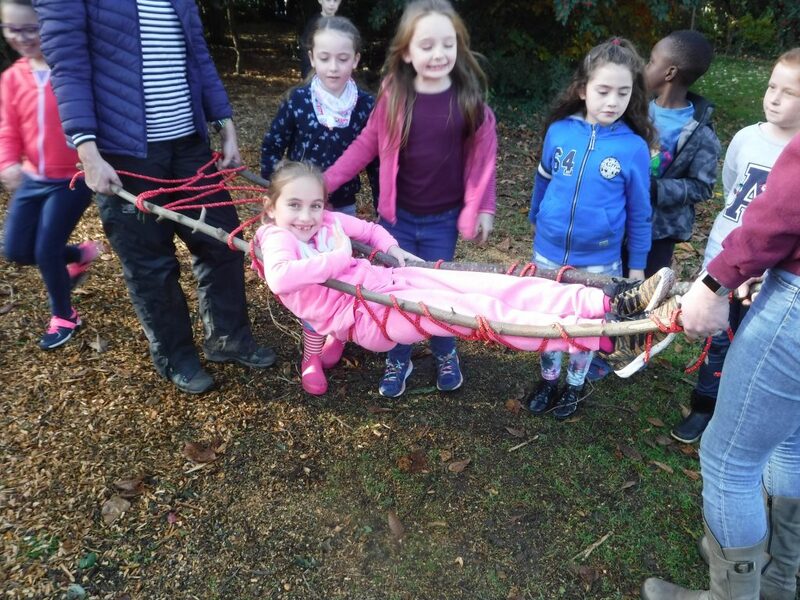 They developed their rope work by tying a series of knots to create a stretcher string enough to carry a child!